Founded in 1977 by actor/producer IAN LISTON, The Hiss & Boo Company is one of the major providers of Pantomime, Variety and Revue entertainment in the UK. The Company also have an established overseas market: in recent years they've paid many visits to the Middle East and other parts of the world where they provide a wide variety of entertainments: Hiss & Boo's Best of Broadway Musicals, The Best of the British Musicals and Best of British Music Hall & Variety with their inimitable brand of comedy entertainment are always well received by audiences at home and overseas. Apart from playing theatres large and small throughout the UK and overseas with a mixture of quality plays, concerts, shows for children and Music Hall, Variety and Comedy Shows, The Hiss & Boo Company provide themed events, corporate entertainment and a wide variety of entertainment services. British Overseas Trade Group for Israel, British Week Tel Aviv, British Week Amman, Jordan. Various 'sponsored' events in Dubai, Abu Dhabi, Qatar and Bahrain. Barratt Homes, ANZ Grindlays Bank and The Ideal Home Exhibition. The Hiss & Boo Company have also produced plays and musicals in London's West End. These include Nunsense, Neil Simon's Last of the Red Hot Lovers, Oscar Wilde's An Ideal Husband, Corpse! by Gerald Moon, the award winning Groucho: A Life in Revue, Double Act and The Mr Men Musical. These productions - together with many more - have also featured on Hiss & Boo's UK national tours. Hiss & Boo shows have been seen in over 200 UK theatres and venues… and in 11 overseas countries. Over the past ten years Hiss & Boo have been touring the RSC’s enormously popular Shakespeare Revue to venues large and small at home and overseas …and on the seas in various luxury, up-market cruise liners! They have also produced a revue in celebration of the British Countryside Come Rain, Come Shine featuring a large cast of actors from BBC Radio 4’s The Archers. With a thriving new scenery store and workshop in Oxfordshire the company is increasing its set hiring business. Two new sets were built in 2008 – Sleeping Beauty / Beauty and The Beast - and a new Jack & The Beanstalk. A new Cinderella will be seen in 2009 at The Queen’s Theatre Barnstaple (including some spectacular new illusions) and more new pantomimes are in the planning together with the development of revue-type entertainments and quality plays for the touring circuit at home and overseas. New shows for 2009/10 include the continuing successful touring of The Shakespeare Revue, a brand new show, On the Grapevine – a wonderfully witty revue celebration in music, comedy and song of the joys of food and wine - and The Great American Songbook, celebrating four decades of American popular song . Other Shows in preparation include Vicars in a Twist, Theatrical digs, Love etc. and a revival of Hiss & Boo’s hugely successful 1987 production with Welsh National Opera of DEAR IVOR – a celebration of the life of Ivor Novello. The company regularly provide Music Hall and Variety shows as fundraisers for various organisations including Rotary and national charities such as The Royal National Lifeboat Institution. The last few years have seen Hiss & Boo concentrating to a much greater extent on the production of top-notch pantomimes. They are all written afresh each year especially for the company by writers such as Ian Adams, John David, Phil Willmott, Richard Gauntlett, Roy Hudd, Kate Edgar and Colin Wakefield. These top notch shows are now regular fixtures in the performance schedules of several major No. 1 touring theatres and regularly feature star name artistes such as Jeffrey Holland, Judy Buxton, Jane Tucker, Todd Carty, Barnaby, Brian Hibbard, Peter Duncan, Isla St Clair, Rick Wakeman, Colin Baker, Fascinating Aida (Adele Anderson & Dillie Keane), Wayne Sleep and Jimmy Cricket. Recent commissions for Hiss & Boo include Kate Edgar and Colin Wakefield to write new productions featuring a cast of actor/musicians of Little Red Riding Hood, Sleeping Beauty and Puss in Boots for The Theatre Royal Winchester and Richard Gauntlett to write new productions of Peter Pan and Sleeping Beauty for The Riverfront Theatre, Newport. 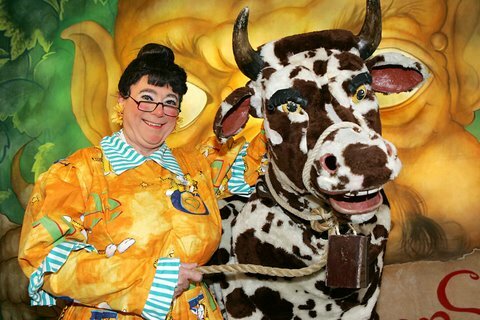 See our pantomimes section for current productions. The company prides itself on the standard of its personal service... and the first class quality of its productions.